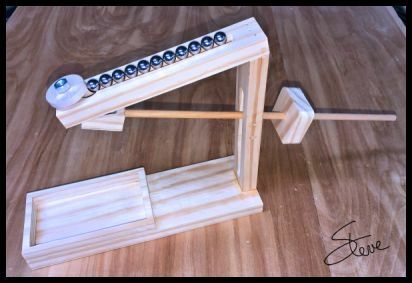 Ball Drop Toy Scroll Saw Pattern. 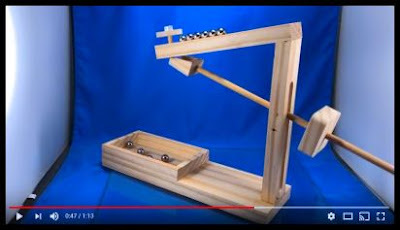 You need to watch the video below to see this toy in action. Once you see it work you will want to build one. It really is a pretty cool action. I cannot take credit for the idea of this little toy. I have seen these several times over the years and always wanted to build one. I designed the plans and put it together tonight. It takes a couple hours to build and a little more time to get it adjusted. The pattern for this project will give you measurements for all the parts but they may need tweaking for the material you use. This project will require some thought to build. The directions are not step by step directions. Look over the video and the pictures. Use them to help build the project using the included plans. The toy works with balance and weight. It will need adjusting to get the action right. 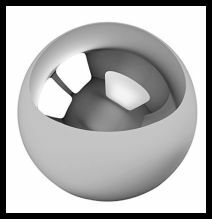 You will need 1/2" diameter steel balls for this project. You can get a pack of 40 for under $10 on Amazon. Quick Tip: Is the blade centered? This may sound obvious, but it causes more problems than you may think. 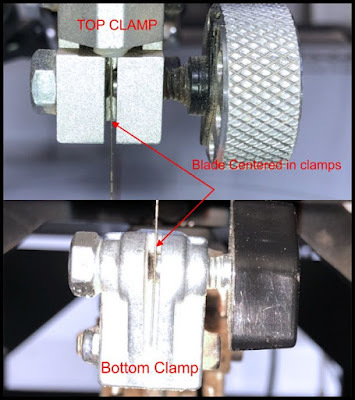 When you install a blade in your scroll saw it is a good idea to occasionally check to make sure it is centered in the clamps. Make sure the set screw and thumb screw meet in the middle of the clamp. On some machines, the set screw will vibrate enough to unscrew itself over time. If they are not centered you can have more frequent broken blades. You may also notice that the blade starts bending after you unclamp it a few times. If the blade is extremely off centered you may also have trouble controlling the cut. This is especially true with fine fretwork. You will notice in the photo above that there are lock nuts on the left set screw. These are there to prevent the set screw from moving. Unfortunately, these are not on most saws. You can also use Loctite on the set screw to keep it from moving. Make sure you do not use the Red Loctite. The Red Loctite requires heat to remove. Use the Blue Loctite. You will be able to break it free with hand tools when you need to remove the set screw. 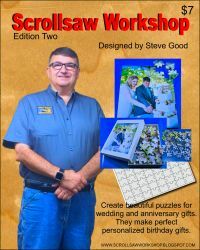 Jigsaw Puzzle Template Book. $7. Instant download after payment. Make an instant family heirloom puzzle with your photo and these templates. There are templates for all the common photo sizes. Templates up top 300 pieces. Link to Video Demonstration of this project. Safe and secure payment with your credit card. just let me know within 15 days and I'll do a full refund.